Greece, a country in Southeastern Europe in the South End of Balkan Peninsula bordered by Albania, Macedonia, Bulgaria, Turkey, Aegean Sea, Ionian Sea, and the Mediterranean Sea has a total land area of 50,944 square miles and a population of around 11.3 million. It is categorized as a developed country with a high-income economy and very high quality of life. Many great mathematicians, philosophers, thinkers, and scientists had made Greece famous from very ancient times. Olympic Games and democracy took root here. The shipping industry of Greece is very strong though currently its fleet roster is smaller than that in earlier days. The main sectors of economy are tourism, shipping, and services. 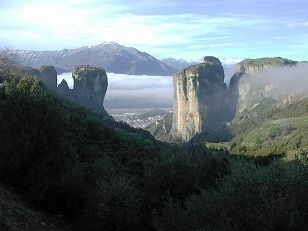 Its location along with its political and economic environment has encouraged many multi-national companies to base out of Greece. May through October is considered tourist friendly with July and August being peak season. The ancient ruins and the museums provide a glimpse into its rich intellectual past. The Acropolis and the Parthenon score big on this account. Some of the other major attractions are Cape Sounion, Temple of Poseidon, the beautiful beaches and the sun-kissed isles, the city of Athens, Delphi (oracle), Temple of Apollo, Knossos etc. Greek cuisine, bathed in flavorful olive oil, is generally an endless combination of vegetables, seafood or meat. Healthy and unpretentious, it aims to satisfy and please all. Frommer’s Greece 978-0470526637 $15 Detailed maps, reviews of hotels and restaurants, itineraries, walking tours, and trip-planning ideas and insider tips from local expert authors. D’Aulaires’ Book of Greek Myths 978-0440406945 $13 An amazing introduction to Greek mythology age-appropriate for any over 10 years. Michelin Map Greece 978-2067123137 $10 1:700,000 scale. Driving focused with times and distances along with road safety information. The first stamps of Greece were a set of seven stamps released in 1861 in the Hermes theme. The set (Scott #1 to #7) are very rare and valuable. The set in mint condition catalogs for around $2700 mint and a little less for used. Many varieties based broadly on the Paris Prints and Athens Prints exist and some of them fetch into the thousands depending on the type of variety/error. The first set was followed by another set (Scott #8 to #15) later that year and a number of other sets in the same theme until 1886. Most of these early sets are extremely valuable with genuine varieties and errors fetching even more premium. The original designs were replaced by a new design in a Belgian print issued between 1886 and 1891. Those sets (Scott #64 to #72 and #81 to #89) along with a couple of Athens Prints (Scott #90 to #105 and #107 to #116) catalog for a little compared to the first sets. Hermes is a messenger of God in Greek mythology. Greece released a set of twelve stamps in 1896 to mark the first International Olympic Games of the modern era. The set (Scott #117 to #128) catalogs for around $1,000 mint and around $700 used. The designs show allegories of boxers, discobolus, vase depicting Pallas Athene, chariot driving, stadium and Acropolis, Statue of Hermes, Statue of Victory, and Acropolis and Parthenon. As Greece was the original home of the Olympics, the Coubertin Congress (precursor to the International Olympic Committee) unanimously elected Athens as the venue. The set of stamps helped raise funds for organizing the Olympics to the order of slightly more than 10% of the estimated costs, a significant achievement compared to just over 5% realized by ticket sales. A set of fourteen stamps released on April 1, 1927 to mark the centenary of the defense of Messolonghi against the Ottoman Empire during the Greek War of Independence. The set (Scott #321 to #334) catalogs for around $550 MNH and around $40 used. The designs show Corinth Canal, Dodecanese Costume, Macedonian Costume, Monastery of Simon Peter on Mount Athos, White Tower of Salonika, Temple of Hephaestus, The Acropolis, Cruiser Georgios Averoff, Academy of Sciences in Athens, Temple of Hephaestus, and Acropolis. This was followed by a sister set on August 1, 1927 to mark the centenary of the liberation of Athens. That set (Scott #335 to #336) catalogs for around $35 MNH and around $10 used. The Greek stamp themes were dominated by issues commemorating the war until 1930. A long set of eighteen stamps released on April 1, 1930 to mark the centenary of Greek independence. The set (Scott #344 to #361) catalogs for around $200 MNH and $80 used. The designs show Constantine Rhigas Ferreos, Gregorios V, Prince Alexandros Ypsilantis,Admiral Lascarina Bouboulina, Athanasios Diakos, Theodoros Kolokotronis, Konstantinos Kanaris, Georgios Karaiskakis, Markos Botsaris, Andreas Miaoulis, Lazaros Koundouriotis, Count John Capo d’lstria, Petros Mavromichalis, Dionysios Solomos, Adamantios Korais, and Map of Greece in 1830 and 1930, Sortie from Missolonghi, and Allegory of Patriots declaring independence. A set of eight stamps released between 1946 and 1947 to mark the events of World War II. The set (Scott #490 to #497) catalogs for around $60 MNH and around $6 used. The designs show Naval Convoy, Torpedoing of Cruiser Helle, Women Carrying Ammunition in Pindus Mountains, Troops in Albania, Campaign of Greek Troops in Italy, Allegory of Flight, Greek Torpedo Boat Towing Captive Submarine, and El Alamein Memorial Tomb. Stalling of the Italian invasion of Greece in 1940 is considered by many historians as the first turning point of the war, as that delayed the invasion of Soviet Union. As the Russian winter had set in by then and because of other factors, that invasion ultimately failed. Two critical battles that both ended in Allied victories happened in the Egyptian border town of El Alamein in 1942. Winston Churchill’s famous words “Before Alamein we never had a victory. After Alamein, we never had a defeat” was written after the war based on these battles. A set of four stamps released on June 15, 1951 to mark the 1900th anniversary of Saint Paul’s visit to Athens. The set (Scott #535 to #538) catalogs for around $130 MNH and around $70 used. The designs show altar and sword, Allegory of Saint Paul, Saint Paul painting by El Greco, and Saint Paul preaching to Athenians. A long set of seventeen stamps released on February 15, 1961 in the Tourism theme. The set (Scott #691 to #707) catalogs for around $30 MNH and $5 used. It features the following landscapes and ancient monuments: Meteora, Hydra Harbor, Acropolis in Athens, Mykonos, Saint Catherine’s Church in Salonika, Olympia, Knossos, Rhodes, Epidauros amphitheater, Temple of Poseidon in Sounion, Temple of Zeus in Athens, Aslan’s Mosque in Loannina, Mount Athos, Santorini, and Marble Lions of Delos. A set of five stamps released on June 28, 1969 in the ‘Greece and the Sea’ theme. The set (Scott #953 to #957) catalogs for around two dollars MNH and around a dollar for used. The designs show a painting of Brig and steamship by Loannis Poulakas, oil tanker, merchant vessels and warships, warships on maneuvers, Battle of Salamis, and Painting by Constantine Volonakis. Greece is a Mecca of shipping magnates and Greek-owned maritime fleet is the largest in the world accounting for close to 20% of the world’s fleet capacity. Greek maritime industry took shape after World War II when Greeks bought surplus ships from the United States Government (Merchant Ship Sales Act of 1946). A set of twelve stamps released on February 17, 1986 in the Greek Gods theme. The set (Scott #1546 to #1547) catalogs for around $20 MNH and around $7 used. The designs show Hestia, Hermes, Aphrodite, Ares, Athena, Hephaestus, Artemis, Apollo, Demeter, Poseidon, Hera, and Zeus. A set of ten stamps released on July 15, 1998 in the Castle Ruins of Greece theme. The set (Scott #1908 to #1917) catalogs for around $18 MNH and $10 used. The designs show HIerapetra, Korfu, Limnos, Argolis, Iraklion, Navpaktos, Loannina, Plataea, Karitainas, and Fragkokastello of Crete. The first coins of ancient Greece were issued in Lydia (present day Turkey) around 600 BC. The coins were of electrum, a natural alloy of gold and silver. Ancient Greek Coinage issues are spread out over three periods: the Archaic (600 BCE to 480 BCE), the Classical (480 BCE to 330 BCE), and the Hellenistic (330 BCE to 100 BCE). The coins were all hand-made although technical improvements happened throughout the time period. In the modern era, Greece gained independence from Turkey following 1821 to 1827 revolution and coins were issued starting the following year. The first coin was a Copper Lepton (100 Lepta = 1 Drachma) issued in 1828 with a Phoenix design in Obverse and denomination and wreath in Reverse. The issue catalogs for around $2500 UNC. Ancient Coins $50 and up Pisidias from around 100 BC starts around $50. Certified Bronze Coins from 200 BC and prior dates start around $100. Thick and Thin Athenian Silver Tetradrachms from the 5th century BC starts well into the 100s. Other Coins $1 and up Common Drachmais from the 1950s onward in VF starts around $1. Leptas from the early 20th century in VF starts around $10. Euro Silver Proof Sets and other Commemorative Silver Proofs start around $50 and go well into the 100s. Gold coins go into the 1000s. Paper Money $2 and up Common Banknotes in UNC starts around $2. UNCs from the WWII era start around $15. Proofs along with bundles from the 1940s and prior dates go well into the 100s. Ancient pottery, statues, vases, worry beads, honey, baked goods etc., are typical souvenirs from the region. Antiques $10 and up 19th century maps start around $10. Handmade Ceramic Charger figures from the 1950s start around $25. 18th century and prior maps starts around $100. Bronze statues and other curios from the 19th century and older start around $100. Art $20 and up 19th century vases and ornament mosaic prints start around $20. 20th century travel posters and 19th century landscape prints start around $25. Statues and original canvas prints start around $40. Mediterranean art paintings start in the 100s and authentic statues, figurines, etc go well into the 100s. Collectibles $10 and up Figurines start around $10. Greek Myth Zeus pottery vases and other curios start around $100. Greek Orthodox church items like exquisite candle-holders also start in the 100s.